If you have any questions, contact David Nichols at david5cents@aol.com or call him at Home: 980-237-2538 or Cell: 704-591-8249. If you would like to join a scheduled trip as an individual, please contact us and we would be happy to put you in contact with the group leader. Oftentimes when a group travels to Bayonnais they enjoy hosting a sponsorship event either before or after the trip. This allows for not only the visiting members, but others to be involved in the process. Its exciting to see the relationships develop between the sponsors and children. If your group is interesting in holding a sponsorship event, please contact Alan Palmer. Trip spacing: one week on, one week off, SUBJECT TO: US or Haitian holidays, religious days, school-wide quarterly exams, summer off, hurricane season, elections, etc. Travel by OFCB people to/from Port au Prince should not be required on Sundays, i.e. no arrivals into	or departures from Haiti on Sundays. Also there should be no departures from Bayonnais on Sundays to be in PAP for an early departure on Monday. must be cleared with David Nichols, Travel Coordinator for OFCB Ministries, Friends of OFCB and World of God. This will avoid problems with transportation schedules TO, FROM, & WITHIN Haiti. Do this BEFORE solidifying plans for your trip and remain in touch with him during the rest of your planning process. Please err on the side of asking too many questions. PLEASE send a copy of your flight schedule to David as soon as you have made a reservation. Travel times within Haiti depend on weather, time of day, traffic issues, local road conditions, vehicles available and market days. As an example, a departure from PAP at 1:30 p.m. = 6 hours allowed. At the beginning of 2019, American Airlines reduced their number of daily flights to PAP somewhat. The first flight from CLT (at 7:35 a.m.) results in a short (50 minute) connection in Miami which seems to work OK since all we have to do is walk for 10-15 minutes to another gate. The 12:45 p.m. arrival in PAP allows us to usually reach Bayonnais in under 6 hours. The only option to PAP arrives at 4:45 p.m., resulting in substantial driving in the dark. Returning home, the 1:40 p.m. flight to Miami usually allows time to eat before the 2 hour 5:49 PM flight to CLT. This covers the expenses OFCB expends to transport you from Port-Au-Prince to Bayonnais and return, any meals from PAP and back to PAP, comfortable housing with bunk beds, indoor toilets and showers and three meals a day of good Haitian cooking. 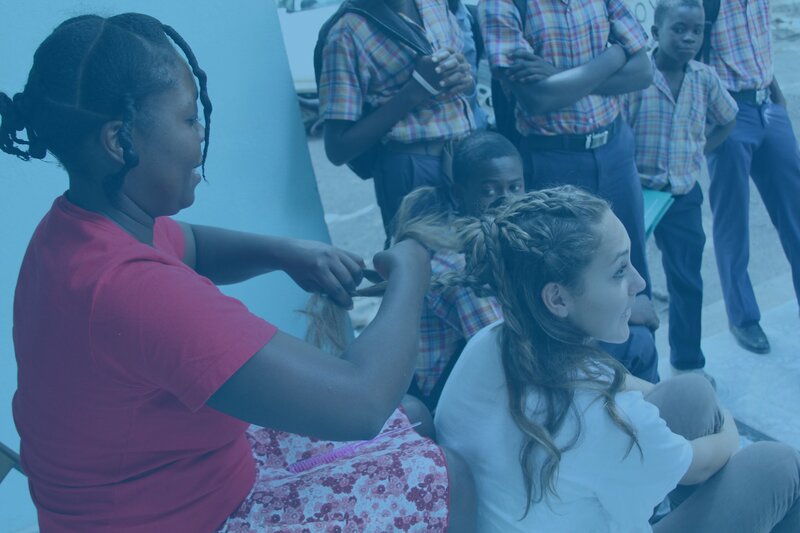 The current rate is $50 per person per day or part of day spent in Haiti. In order to be certain that OFCB has the funds to properly set up for your trip, mail the group per diems to Friends of OFCB, Box 34563 Charlotte NC 28234-4563 Attention: Treasurer to reach the box no later than 6 WEEKS BEFORE the date of the trip. Please send the per diems for all in the group in one check from your church or from a person collecting per diems from all in the group. Friends does not have the capacity to track individual per diem checks. Include the dates of the trip, head count, per diem per person and sponsoring church or other organization in a note with the check. Copy david5cents@aol.com Please include on Nichols copy: church or other organization, contact person email and phone, start and end dates, # males, # females, and per diems per person. SEND an e-mail to treasurer Joe Muse: jmuse2@carolina.rr.com when the check has been mailed!